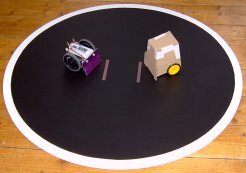 When you start building MiniSumo you'll need a surface to try out your 'bot. When your using optical edge detection the options are relatively simple. We've provided a number of printable PDF sheets you can use to give you a black circular surface with a white edge. When building 'bots that use physical edge detection the surface colour doesn't really matter as long as you have your edge. A4 (1/4 Full Size), easiest print size for home builders. A3 (1/3 Full Size), our favoured size for desktop testing (common print size). A0 (Full Size), sized for print shop production. If you're looking for an A0 Print expect the cost to be in the region of �2.50 to �4.00 for Black and White prints, if you're looking for a colour print, for the sake of the brown starting lines, the price can jump to between �8.50 and �30, at the higher end it's just as cheap to build an MDF ring. MDF (Medium Density Fibre board) is a man made material used as an alternative to timber and comprises of wood fibre and resin formed under heat and pressure in sheets. MDF's fine, smooth finish makes it idea for a minisumo dohyo and it's readily available from DIY shops around the country. Typical board sizes are 2440x1220mm and give enough material for 3 Dohyos. Think about asking if the shop can cut the board into a more manageable size, this will usually be done at no extra cost. A guide price for 12mm MDF sheets is �10 and 25mm can cost �25 or more. Dohyos made from the thinner sheet can be placed on blocks to give the required hight, while the 25mm board will be much heaver to transport. MDF dust, generated while cutting and sanding, contains small particles of wood fibre and resin that can pose a hazard to health through inhalation. As a minimum protection you should wear a dust mask while cutting this board and cleaning up dust. 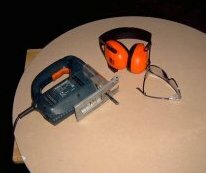 When using power tools you should wear ear and eye protection, in this case you should also wear a dust mask. Check the instructions for your tools, ensure you know how to it and take the correct safety measures. MDF does not have an easily recognisable surface grain and is easily cut. 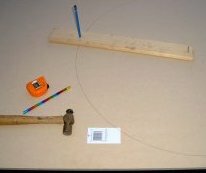 We used a medium blade on a Jig-Saw to cut our Dohyo, while the high resin content can blunt the cutting edges of your tools very quickly we'd no problem with the Dohyos cut. Take a little care when following your line as this will have a large effect on the finish of your Dohyo, and don't forget to avoid cutting anything your using to support the MDF while you're cutting! Remember to read the warnings and precautions on your paint tins. Paints vary considerably and we can not account for the differences in products you might use. Pay attention to warnings for Irrants and Flammables and take the appropriate precaution. The usual practice, when painting MDF, is to prime the surface. As MDF has quite porous surface it can give a blotchy uneven finish as paint dries into it. There are a number of MDF primers that can be used, in general they will then allow a better finish with any other ordinary paint, we have tried painting the Dohyo with and without primer. In both cases sanding between coats of paint made all the difference to getting a smooth finish. Starting with the bare MFD we applied a coat of primer, it was difficult to get a finish that didn't have some visible brush marks. 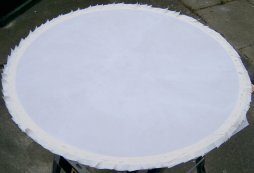 While one coat was enough to get an initial seal, two coats where required to get a white that looked consistent enough for the Dohyo's edge. With the paint dry a block and pencil was used to mark a line 25mm from the outer edge (obviously if you've cut a wobbly edge you'll get a wobbly line - take care with your cutting!) and masking tape was applied in strips to cover the white edge we wanted to remain. By using more pieces of tape, and fitting closely to the marked line, the faceting between black and white surfaces will be reduced. 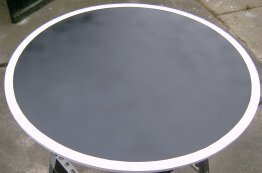 The matt black was sprayed painted, several coats where required to get an even finish. Some sanding was required between coats to smooth out the surface but some small brush lines remained visible from the undercoat. Now what remains is the masking required to paint the starting lines. Trying spray paint onto an unprimed surface the grain was appearing in the MDF. It looked like this ruined the ring, however, with a small amount of sanding and a few additional coats the spray alone produced a superior smooth surface. While it took more paint to get to the desired finish this could be weighted against the cost saving in primer. Having sprayed the surface black we found it more time consuming to mask the internal edge of the white line compared to masking to protect the existing white of the primer in the other method. It would be quicker, and easier, to spray the white edge, mask to finish the back surface, and then mask for painting the starting lines. Here we masked to spray the edge and starting lines at the same time. 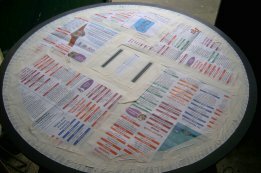 The centre mask was cut over size but was marked to guide placing masking tape to the required size (1x10cm). Make sure your masking tape is well stuck to avoid paint bleeding under it, and don't go mad with the paint to avoid stepped edges. With painting complete we're ready to go! Spraying, without undercoat, each Dohyo would probably use a 400ml spray can of Matt Black. One can of Flat White and Matt Brown will do much more than the three dohyos that could be made from a standard MDF sheet. Allowing for some masking tape, sand paper, and paying �6.00 per spray can, each Dohyo cost about �15. If you're only making a one Dohyo the cost is going to be higher but there are options to keep the cost down. Some smaller DIY shops are more flexible in selling timber products, you may find you'll get part of a MDF sheets to suit the actual size you need. A few quid could be saved painting the white and brown areas by looking for smaller 200ml spray cans. A4 PDF - 1/4 Full Size. A3 PDF - 1/3 Full Size. A0 PDF - Full Size.